COURBEVOIE, Frankrijk –(BUSINESS WIRE)– IDEMIA, de wereldleider in Augmented Identity, kondigt met trots aan dat CloudCard+, een Strong Customer Authentication Solution, gebaseerd op mobiele en biometrische gegevens, is bekroond als winnaar in de categorie Best Payment Authentication Solution van de 2018 JUNIPER research awards. CloudCard+ maakt Strong Customer Authentication (SCA) eenvoudig maar veilig. Het stelt klanten in staat om hun dagelijkse mobiele apparaten en biometrie (gezicht of vingerafdruk) te gebruiken om sterk te authenticeren tijdens het online winkelen en het uitvoeren van gevoelige banktransacties zoals geldovermakingen en betalingen. Het biedt een consistente authenticatie ervaring, ongeacht het verkoopkanaal. 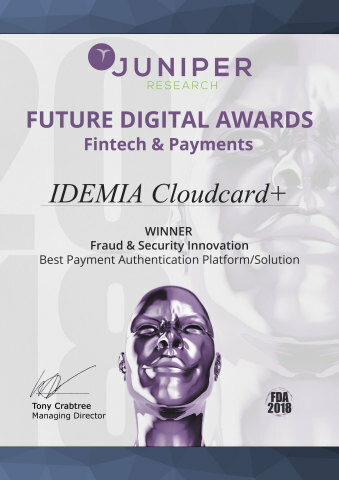 COURBEVOIE, France–(BUSINESS WIRE)– IDEMIA, the global leader in Augmented Identity, is very proud to announce that CloudCard+, a Strong Customer Authentication solution, based on mobile and biometrics, has been recognized as a winner in the Best Payment Authentication Solution category of the 2018 JUNIPER research awards. CloudCard+ makes Strong Customer Authentication (SCA) simple but secure. It allows customers to use their everyday mobile devices and biometrics (face or fingerprint) to strongly authenticate while shopping online and performing sensitive banking transactions like money transfer and payment. It provides a consistent authentication experience whatever the sales channel. CloudCard+ satisfies PSD2 requirements regarding SCA, with which banks have to comply before September 2019. It is a swift to deploy and cost-efficient solution to replace SMS OTPs, which are not compliant with PSD2 SCA requirements. For further details on the Future Digital Awards, or on Juniper’s full range of research, please contact Sam Smith, Press Relations.